XIII. How Toxoplasma changes the appearance of its human host | Frozen Evolution. Or, that’s not the way it is, Mr. Darwin. A Farewell to Selfish Gene. As I mentioned, one way that we measured Suspiciousness with behavioral tests, was by asking the test subjects if we could take an anthropometric measurement. We then observed, how willing the person was to agree, and how cooperative they were during the measurement. A side-product of this test was that we were left with detailed anthropometric data for about 500 students. With each student we measured about 30 body parameters, including earlobe height and width, wrist width and head circumference. With this data available, we decided to see if Toxo positives and negatives differed in any of these measurements. We were primarily interested the so-called fluctuating asymmetry of Toxo positive humans. It’s commonly known that humans aren’t perfectly symmetrical; they may have a wider left or right wrist, or a longer left or right palm. The direction of the asymmetry differs among individuals, and even from organ to organ – sometimes the left side is larger, sometimes the right. This is why the asymmetry is termed as fluctuating. In addition, a number of organisms exhibit directional symmetry, which means that most of the members of a given species have one side of the body more developed. It is thought that the level of fluctuating asymmetry reflects the quality of an individual’s development – individuals that were exposed to more disruptive effects during their development, whether as the result of a mutation, an unfavorable gene combination from their parents or harmful environmental effects, turn out asymmetrical. Many scientists believe that females, including human females, choose the more symmetrical male during courtship, because his symmetry indicates a more likely favorable gene combination. Because many of our test subjects were infected as children, long before they finished development, we hypothesized that infected individuals would exhibit higher fluctuating asymmetry than those who were uninfected. As always, our lovely Toxoplasma had a surprise in store. It turned out that Toxo positives and negatives exhibited minimal differences in fluctuating asymmetry, but significant differences in specific anthropometric measurements. If there was any asymmetry, then it was likely directional – in several anthropometric measurements, all the Toxo positives were asymmetrical to same side. Toxo positives had a wider forehead, a wider left ear, wider and longer palms, longer fingers on both hands and wider ankles. The most obvious difference that we noted in men had to do with body height – Toxo positive men were an average 3 cm taller than Toxo negatives (54). Another difference that stood out was the length ratio of the pointer and ring fingers on the left hand. This was interesting, because scientists think that the ratio correlates negatively with the concentration of testosterone which the embryo is exposed to during intrauterine development. Men usually have a shorter pointer than ring finger, which means that the length ratio of the 2nd to 4th finger is less than one. In women, this difference isn’t as distinct – they often even have a longer pointer than ring finger, so the ratio is greater than one (Fig. 31). For each gender, the ratio correlates with a number of characteristics – in men, with sexual orientation, and mathematical and musical talent; in women, with things like fertility (Box 73 Do homosexuals have a longer pointer than ring finger?). Whenever I mention this anatomical characteristic during a lecture, I might as well excuse myself from the podium, because the majority of the audience begins examining their fingers. Maybe they’re not sure about their gender identity or sexual orientation, and think that the ratio of finger length can serve as guidance. Another possibility is that they want to make sure that the speaker isn’t spouting nonsense (as is often our tendency). Fig. 31 The length ratio of the pointer and ring fingers. A typical woman hand (left) has a greater pointer to ring finger ratio than does the hand of a typical man (right). This means that her pointer finger is longer than a man’s is in comparison to the ring finger. The length ratio on the right and left hand for our female students was 0.986 and 0.981, respectively, and 0.972 and 0.979 for the male students. The difference between the genders is more apparent on the right hand, which corresponds with other reports. Interestingly, a similar difference between Toxoplasma-infected and uninfected people was more prominent on the left hand. fingers on the right hand; there is a stronger correlation between Toxoplasma-infection and the length ratio of the fingers on the left hand. In women, the effect of toxoplasmosis on this ratio was also evident, but not statistically significant. Later, we verified that the concentration of testosterone in saliva correlates better with the ratio of the fingers on the left hand than the right. I’d say that the right hand seems to reflect the traits we were born with (the concentration of testosterone that were exposed to as a developing embryo), whereas the left reveals how we were affected in later life (by things such toxoplasmosis). But since something similar is already expressed by palm-readers, and we scientists put no stock in superstition, I wouldn’t say (or even write!) this under duress. In the conclusion of our published article, we simply stated that when studying the relation of psychological characteristics to the length ratio of the fingers on the left hand, it is important to statistically filter out the effects of Toxoplasma infection and testosterone concentration – these confounding factors could have a strong effect on the digit ratio for the left but not the right hand, and, if not controlled properly, might obscure any existing relationship of the digit ratio with the studied factors (55). Everyone must admit that such a statement is substantially different from supporting fortune-telling superstition; at least, written this way, it sounds more scientific. In any case, I suspect that most palm-readers don’t read the American Journal of Physical Anthropology too often. Since we’ve already digressed to denying superstition: my colleague Lukáš Kratochvil and I also refuted one interesting belief regarding the length ratio of the pointer and ring fingers. This belief was the central postulate of people studying this field; it was the belief that an individual’s gender (as well as most of other characteristics) influences that length ratio. True, this ratio is lower in men than in women, but our results clearly showed that this is only because men usually have larger hands. As the size of the hand increases, the length of the ring finger increases at a greater rate than does that of the pointer. If we made pairs, each of a man and woman with hands of the same size, we’d see no difference in the length ratio of the 2nd and 4th fingers. So it is more correct to say that characteristics like musical talent, homosexuality and fertility, correlate with the length of the hand, rather than the length ratio of the 2nd and 4th fingers (56). The difference, of course, is substantial. It’s difficult to imagine how the concentration of testosterone would specifically affect the length of the 2nd versus the length of the 4th finger. It’s less surprising that the level of testosterone would affect general growth of the hand and fingers (Box 62 Troubles with ratios). The size of individual body parts is often measured in relative terms rather than absolute values –or example, as a ratio to body size. An average size nose in a small face appears large, whereas the same nose in a big face appears small; 180 lbs is overweight for 5 ft tall person, but underweight for nearly 7 ft beanpole. It is generally convenient and quite common to express body measurements relatively, as ratios. For example, the length of the 2nd finger as a length ratio of the 2nd to 4th finger; the width of the shoulders as a ratio to the width of the waist; weight looked at as body mass divided by the square of height, etc. The problem with this system is that individual parts of the body change at a different rate, and beginning from a different baseline, with overall body size and age. Scientifically, they grow allometrically – each with a different slope and constant. The existence of allometry has substantial ramifications for the results of studies on relative values, and should be (though it often isn’t) taken into account when selecting a method to evaluate such data. 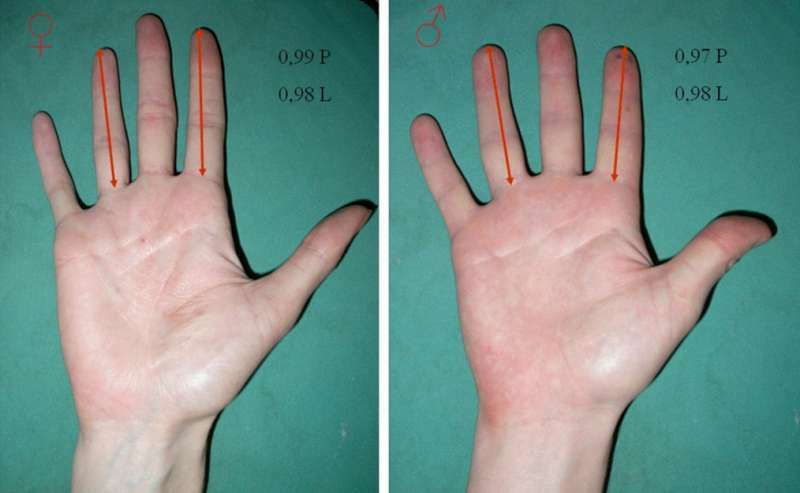 In 2009, Lukáš Kratochvil and I published an article in the journal Biology Letters, showing that when, instead of using the thus far accepted method of comparing the finger length ratio in men and women, one takes a more correct approach (comparing the length of the 2nd while filtering out the length of the 4th finger using the GLM), the difference between genders disappears (56). So the differences that have been described between the genders in the ratios of finger length are due to the fact that women usually have smaller hands than men. Scientists that have spent years studying the length ratio of the 2nd and 4th fingers and published hundreds of papers in this field over the past ten years were certainly not happy to hear of our discovery. I’m interested to see the reaction our next article will elicit; it discusses a similar problem regarding relative values used for years in anthropological and evolutionary psychological research (BMI, WHI, etc.). 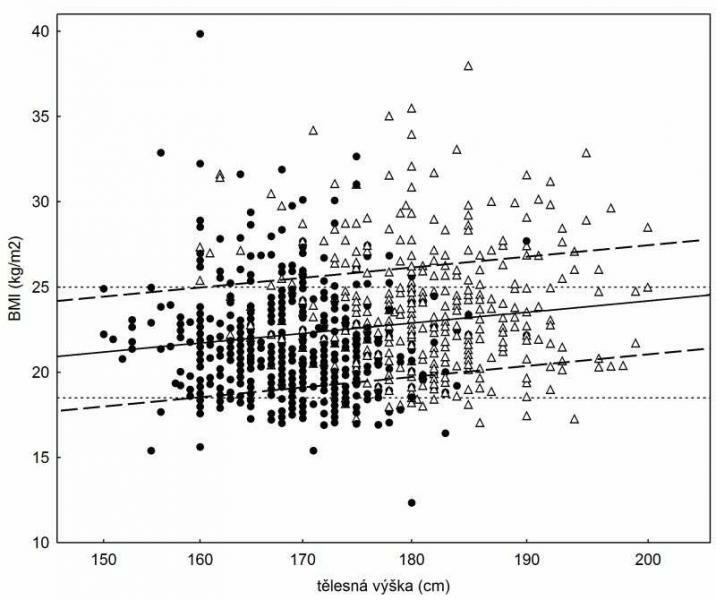 Our data, for example, show that the male visitors of the Prague city library tend to be more obese than the female visitors – but this is only when we compare the genders using the accepted BMI index (body mass index), which is the ratio of body mass to the square of height. When we use a more correct method, which compares body mass after filtering out the effect of body height (using the GLM or ANCOVA method), we no longer see differences between men and women in obesity prevalence (Fig. 32). Fig. 32 Mismeasuring overweight vs. underweight. Usually nutritional status is determined by the body mass index (BMI). BMI is a ratio of weight (kg) to the square of height (cm) multiplied by 10,000. If we will plot BMI versus height, it is obvious, that the two variables have a positive correlation. Therefore, some tall people can be incorrectly categorized by the BMI as overweight, and some short people as underweight, even when their nutritional status is within normal range. In our experimental group of a thousand visitors of the Municipal library (circles: women, triangles: men), 40 people were incorrectly identified as overweight and 68 as underweight (they were outside the area marked off by the horizontal dotted lines, but still within the range designated by the inclined dashed lines). This demonstrates that the BMI is not a perfect estimate of nutritional status. experience increased body growth. It’s likely that in countries where infection occurs even earlier, or significantly later, the effect of toxoplasmosis on the body height of men is different, maybe even opposite.